These binocllars are exactly what I was looking for. Compact, light weight, water resitant and easy to use. The fit on my eyes is excellent and the field of vision is very clear. I recommend these binoculars. 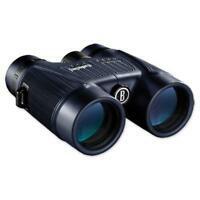 I purchased the binoculars primarily as a compact light weight back-up for hunting. 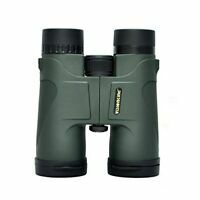 They are compact and light weight but I was very disappointed in their low light performance that is so important for hunting binoculars. I guess that is a common problem with inexpensive 10x binoculars with 25 mm objective lenses. These binoculars are also a little difficult to focus. Had I tried them before I bought them, rather than relying on on-line reviews I probably would have passes on them. I have a pair of 8x 32mm Redfield Rebel binoculars that are vastly superior and not significantly larger or significantly more expensive. 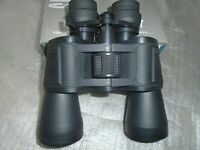 I read many reviews for many different compact style binoculars. I was looking for something small, durable, with good lense quality to view wildlife. I would recommend these to anyone and the fact that they are waterproof is such a bonus! They offer a very clear crisp image. I plan to use these for many years. They are very compact, very sturdy and well made. Easy to fold in to store or out to see through. Crystal clear view with simple adjustment from center knob and more precision with eye focal knob. Love the feel of material. I haven't had them get wet so can't comment on waterproofing. Highly recommend.